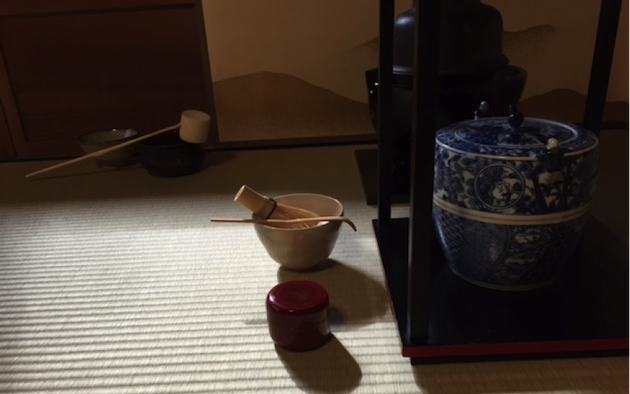 Samurai loved tea ceremony, Cha-do so much! I don’t know much about warrior and Samurai and have no experience of them. However, when you listen to the story of Tea Ceremony, warrior and chivalry, I think they have something in common historically. Although Tea ceremony was established by Senno Rikyu (1522～1592）, it was Nobunaga Oda (1534-1582) and Hideyoshi Toyotomi(1537-1598) who placed Rikyu as a tea master. The tea room was often used as a place for the politically confidential talk at that time. They take a bow regardless of their position when they get in the tea room where its size is 2 or 1.5 tatami. Samurai had to take off their important swords in front of the small gate of the tea room which means everybody was equal. You might imagine tea ceremony is for ladies, but actually, Samurai deeply related to the establishment of the tea ceremony. 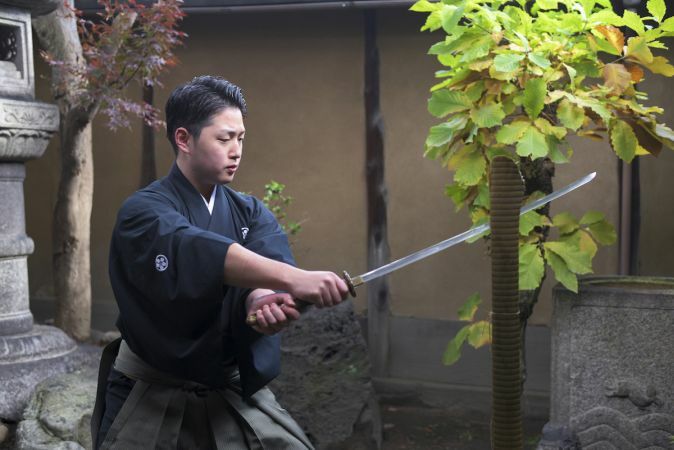 The process of chivalry training has something in common with Tea ceremony. They practice over and over again until their body remembers every movements. They go to the next step after their body remembers it. Even if they remember all the movements, it is not the end. They start over from the basics to perform better and more beautiful. There are three important things in Tea ceremony. The first one is “Posture” which means not only sitting with a straight back, but also the entire attitude. However, the thing that is the most important is the warm heart to welcome customers not the order of tea ceremony. The second one is “Position” which is the position of tea utensils. The third one is “timing”. Even if we finish the way of tea with no mistakes, it will be disappointing if the speed is too fast or too irregular. That is, we need to adjust the timing in response to customers. Don’t you think these 3 are similar features as Chivalry? It feels like my breath is naturally caught when I am doing Tea ceremony or sitting in a tea room as a customer. It is said that the breath is very important in tea ceremony. We often have difficulties in our lives such as an outrageous experience we can’t forgive, things we wish to forget at once or don’t want to think about. We sometimes suffer from the unstable feelings. I think the right minded way written as the charter of the NPO group of Bushido in Japan (http://www.bushido.or.jp/contents.html#a_rinen) is far from me. 15th grand master of Urasenke tea school is the chairman of the group. It’s too difficult for me to be such a perfectly right person. But I believe it’s because I could have the time to go to tea room that I can remember the peace in mind for my life. Don’t you think it is good idea for people learning Bu-do to experience tea ceremony? We might be able to learn and discover the common point each other.